A photo album of our 2018 UTTERLY UMBRIA tour. La Dolce Vita Wine Tours cofounder Claudio Bisio welcomes guests to Tenimenti d’Alessandro, the first stop of this 6-day tour. Okay, we fudged a little on geography, since we’re actually in Cortona, Tuscany. But that’s close enough for us to lose sleep if don’t let clients taste their award-winning syrah and viognier. They were the pioneers, after all, who figured out just how well these Rhone varietals grow in Cortona’s clay soils. Plus, it’s a really lovely place, complete with 17th C. villa and the prettiest greenhouse-turned-tasting room. October tour dates mean we arrive during harvest. On the blackboard, the instructions read EAT? SLEEP? HARVEST. REPEAT. Lunch takes us to Lake Trasimeno, Umbria’s largest lake. We wash down a seafood pasta with a white blend from the nearby hills. Now, that’s zero-kilometer dining! Next up, wine awaits at Castello di Magione, a castle of the Knights Templar. Once a hostel for 13th century pilgrims on the Via Francigena heading to Rome and Jerusalem, it’s been associated with wine since its beginnings. During the Renaissance, it became a fortress for the Order of Malta and was cited in Machiavelli’s The Prince as the place where the plot to assassinate Cesare Borgia was hatched. Since the knights of the Sovereign Military Order of Malta were nowhere in sight, we had this frescoed castle to ourselves, and were intrigued to try an Umbrian pinot noir among their offerings. Spello, the charming hill town where we’re based during the first half of this tour. All that art stimulation works up an appetite. So we head to the plain for lunch in Bevagna. Settled by the Romans on the Via Flaminia, the walled town still has traces of their handiwork, such as this floor mosaic with wriggling creatures from the sea. Umbria prides itself on its vast variety of beans and legumes. Some ancient varieties grow only there, such as roveja, believed to be the predecessor of the pea. This particular soup was made extra-delicious by the addition of chestnuts, then in season. Let Umbrian tastings commence! That means sagrantino takes center stage, one of the most tannic—and resveratrol-rich—wines on the planet. It’s a beast that one wrangles with TLC (on the winemaker’s part), food (on the consumer’s part; we were happy to oblige! ), and bottle age (“Every year you give to Sagrantino is a gift to yourself,” said Eleonora, our host at Caprai). Our introduction to Umbria’s star grape was at Fongoli, one of the oldest wineries in Montefalco, which is still in family hands. They practice biodynamic farming and are experimenting with amphora both to macerate the sagrantino and to age the trebbiano, making an orange wine. Note the odd-shaped door, which enabled large barrels to pass. Sagrantino’s tannins make it a unique dessert wine when done as a passito, and Fongoli’s is a delicious example. One can see how it could be served with savory dishes—as it was through the 1960s, when passito was the only version made. Below: Day 3 was devoted entirely to Montefalco—the town and the wine. Fittingly, we start at Arnaldo Caprai, whose importance cannot be overstated. Owner Marco Caprai rescued the sagrantino grape from oblivion, introduced the dry style, and remains a leader in viticultural research and green practices. Capri has also created special wines to help fund the restoration of Montefalco’s prized jewel: the Church of San Francesco and its frescoes by Renaissance artist Benozzo Gozzoli. Their first project was restoring the tondos that picture our friends Dante, Petrarch, and Giotto (above). It’s really special to see these frescoes at this point in the tour, because Gozzoli set St. Francis’s exploits in contemporary settings, recognizable to the locals—and now to us. St. Francis talks to the birds, for instance, in front of a landscape that pictures Montefalco as it looked in 1450, with Mt. 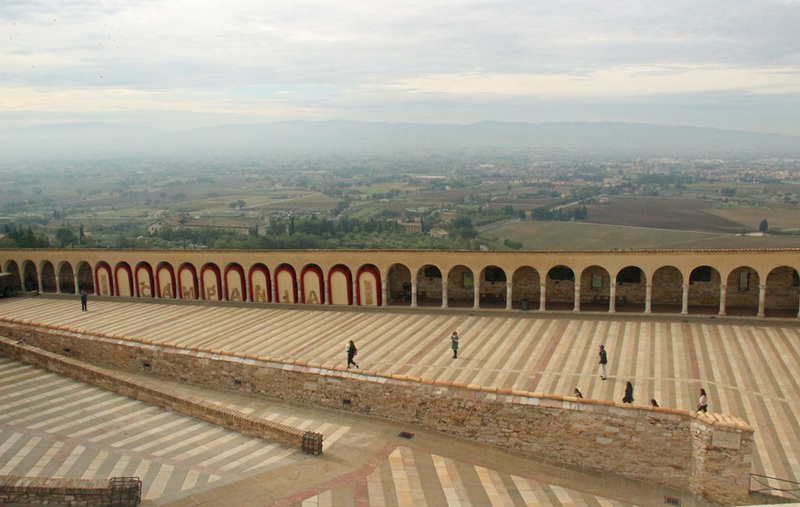 Subasio looming behind, Assisi on its hilltop perch, and Bevagna on the plain. New in the church museum is a place for selfies, with that same landscape emptied of saints. Call us worshippers at the shrine of sagrantino. Next, it’s on to the Antonelli winery, a property built by the Bishop of Spoleto several centuries ago. Happily, we arrive in time to see the grape crush. Day 4 begins with another pioneer, Lungarotti, whose founder put Umbria on the map as a serious wine region, steering away from widespread bulk-wine practices. Though he made his mark with red blends like Rubesco and San Giorgio, our group was jazzed by their two sparklers. Here, too, Giorgio Lungarotti was a maverick, making the very first Umbria Bruts. In the cellar we see evidence: a 1960s conveyor, designed to transport bottles from the riddling room. Flip over virtually any piece of majolica pottery and you’ll find “Deruta” written on the bottom. This town, entirely dedicated to carrying on the majolica tradition, was our destination for lunch and a wee bit of shopping. But just walking around and seeing ceramics ornamenting every door jamb, architrave, and facade made it worth the trip. Orvieto is home base for part two of Utterly Umbria, and our first stop here is its magnificent cathedral, visible for miles around. Inside, we find Luca Signorelli’s heaven (boring!) and the damned going to hell (riveting, as it always is in art through the ages). There’s our old friend again, Dante, no doubt reading the Inferno part of his Divine Comedy—also much juicier. Though their home is Tuscany, the Antinori family—now on their 27th generation as winemakers—set down stakes in Umbria in order to make a first-class white. And boy, did they ever! Their Cervaro della Sala, a blend of chardonnay and grechetto, has been a Tre Bicchieri prize-winner from the moment it launched in 1986. Burgundian in style, it’s sure to coax you out of the ABC club. It did me. And the digs ain’t bad, either: Castello di Sala, where they make seven wines altogether, including a To. Die. For. botrytis-inflected passito called Muffato della Sala, with sauvignon, semillon, riesling, traminer, and grechetto. Me and Claudio signing off. Hope you’ll join our Umbria tour next time!